Grapefruit is a relatively large, evergreen citrus tree, Citrus paradisi. The term also refers to the round, edible fruit of this plant, which grows in small bunches and has a yellow rind (outer skin) and typically a juicy, acidic pulp. 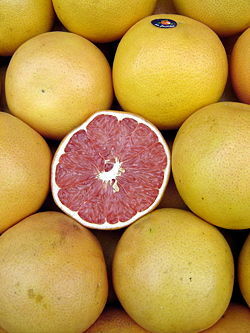 Grapefruit belongs to the Citrus genus, a taxa of flowering plants in the family Rutaceae. Other members of the genus include oranges, lemons, limes, citrons, pomelos (pummelo, pommelo), and mandarins (tangerines). Citrus fruits are a distinctive berry with the internal parts divided into segments. The number of natural species is unclear, as many of the named species are hybrids. The grapefruit is believed to have arisen from the pomelo or shaddock (Citrus grandis) or as a hybrid between pomelo and sweet orange (Bender and Bender 2005). The fruit and flowers of the grapefruit tree provide for the species' individual purpose of reproduction, while at the same time providing a value for the whole, especially humans. For humans, the grapefruit is nutritious, providing many nutrients and phytochemicals important for a healthy diet, including vitamin C, pectin fiber, and the antioxidant lycopene. In addition, the fruit stimulates the senses of sight, taste, and touch, the flowers add an aesthetic value, and the tree, including leaves and fruit, provides ecological values (nutrition for animals, habitat for insects and birds, etc.). All citrus trees are of the single genus Citrus and hybridize very easily. That is, there is only one "superspecies," which includes lemons, limes, grapefruit, pomelos, tangerines, and oranges. Citrus is likely the most widely planted fruit for direct human consumption in the world (Katz and Weaver 2003). Fruits of all members of the genus Citrus are considered berries because they have many seeds, are fleshy and soft, and derive from a single ovary. The distinctive fruit is a hesperidium in that it is a specialized berry with the internal fleshy parts divided into segments (typically 10 to 16) and surrounded by a separable rind (Katz and Weaver 2003). The citrus herperidium is globose to elongated, 4 - 30 centimeters (1.6 - 11.8 inches) long, and 4 - 20 centimeters (1.6 - 7.9 inches) in diameter. The rind is leathery and the segments, or "liths," are filled with pulp vesicles. Citrus plants are small trees or large shrubs, reaching 5 - 15 meters (16 - 49 feet) tall, with spiny shoots and alternately arranged evergreen leaves with an entire margin. The flowers are solitary or in small corymbs (a branched cluster of flowers with lower flowers having longer stems). Each flower is 2 to 4 centimeters (0.8 - 1.6 inches) in diameter, with five (rarely four) white petals and numerous stamens; they are often very strongly scented. The taxonomy of the genus is complex and the precise number of natural species is unclear, as many of the named species are clonally-propagated hybrids, and there is genetic evidence that even the wild, true-breeding species are of hybrid origin. Cultivated Citrus may be derived from as few as three or four ancestral species. Katz and Weaver (2003) claim that the generally accepted view is that there were three primordial Citrus species—Citrus medica (citrons), Citrus maxima (pumelos), and Citrus reticulata (mandarins)—and that all other types of citrus rose from single or sequential hybridization events between these species or their offspring. The hybridized types of citrus may or may not be recognized as species according to different taxonomies. Thus, anywhere from 3 to 170 species are recognized, with the commonly used system of Swingle recognizing 16 species (Katz and Weaver 2003). The grapefruit appears either to have arisen from the pomelo (shaddock or Chinese grapefruit, Citrus maxima) as a genetic mutation or as a hybrid between pomelo and sweet orange (Citrus sinensis in many taxonomies). Although the Citrus genus originated in Asia, Captain Shaddock had brought seeds of the pomelo to the West Indies in the late seventeenth century. Grapefruit trees tend to be larger than most citrus trees. They usually are found at around five to six meters (16 to 20 feet), but can reach 13 to 15 meters (43 to 49 feet). The leaves are dark green, long (up to 15 centimeters or 5.9 inches), and thin. It produces 5 centimeter (2 inch) white four-petaled flowers. The fruit is yellow-skinned in all varieties, some with a pink blush (Herbst 2001). The fruit is largely oblate and ranges in diameter from 10-15 cm (3.9-5.9 in) and has an acidic segmented pulp, which may range from yellowish-white, to pale yellow-pink, to pink, to brilliant ruby red (Herbst 2001). Grapefruit comes in many varieties, determinable by color, which is caused by the pigmentation of the fruit in respect of both its state of ripeness and genetic bent (GMF 2007). The most popular varieties cultivated today are red, white, and pink hues, referring to the inside, pulp color of the fruit. The family of flavors range from highly acidic and somewhat bitter to sweet and tart (GMF 2007). Para-1-menthene-8-thiol, a sulfur-containing terpene, is one of the substances that has a strong influence on the taste and odor of grapefruit, compared with other citrus fruits (Buettner and Schieberle 1999). The fruit became popular only from the late nineteenth century; before that it was grown only as an ornamental plant. The United States quickly became a major producer of the fruit, with orchards in Florida, Texas, Arizona, and California. In Spanish, the fruit is known as toronja or pomelo. The fruit was first documented in 1750 by Rev. Griffith Hughes describing specimens from Barbados (Quinion 2007). The fruit was originally named the "forbidden fruit" of Barbados (Morton 1987), in comparison to the "Tree of Knowledge of Good and Evil" in the Garden of Eden (Quinion 2007). Currently, the grapefruit is claimed by some as one of the "Seven Wonders of Barbados" (Bourne 1996). The grapefruit was known as the shaddock or shattuck until the 1800s. Its current name alludes to clusters of the fruit on the tree, which often appear roughly similar to grapes. The name grapefruit first appeared in English in a work by botanist John Lunan, Hortus Jamaicanensis (1814) (Bender and Bender 2005; Quinion 2007). While the name apparently arose because the fruit grows in grape-like clusters, and can imaginatively be looked at as grapes when small and green, Lunan had stated that it was "known by the name of grape-fruit, on account of its resemblance in flavor to the grape." The grapefruit was brought to Florida by Odette Philippe in 1823. Further crosses have produced the tangelo (1905), the minneola (1931), and the sweetie (1984). Botanically, the grapefruit was not distinguished from the pomelo until the 1830s, when it was given the name Citrus paradisi. Its true origins were not determined until the 1940s. This led to the official name being altered to Citrus × paradisi (Williamson 1997). Grapefruit peel oil is used in aromatherapy and it is historically known for its aromatic scent (Woodward 1991). Grapefruit is an excellent source of many nutrients and phytochemicals for a healthy diet. Grapefruit is a good source of vitamin C (GMF 2007; Fellers et al. 1990), pectin fiber (Cerda et al. 1988), and the pink and red hues contain the beneficial antioxidant lycopene (GMF 2007; Lee 2000). Studies have shown grapefruit helps lower cholesterol (GMF 2007; Platt 2000), and there is evidence that the seeds have low levels of antioxidant properties (Armando et al. 1997). Grapefruit forms a core part of the "grapefruit diet," the theory being that the fruit's low glycemic index is able to help the body's metabolism burn fat (WMUR 2003). 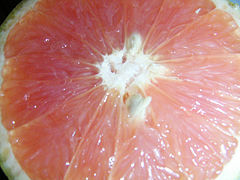 Grapefruit seed extract has been claimed to be a strong antimicrobial with proven activity against bacteria and fungi. However, studies have failed to demonstrate the efficacy of grapefruit seed extract as an antimicrobial. Although GSE is promoted as a highly effective plant-based preservative by some natural personal care manufacturers, studies indicate the universal antimicrobial activity associated with GSE preparations is merely due to contamination with synthetic preservatives (Sakamoto et al. 1996; von Woedtke et al. 1999; Talepla et al. 2001; Takeoka et al. 2005; Ganzera et al. 2006). A 2007 study found a correlation between eating a quarter of grapefruit daily and a 30 percent increase in risk for breast cancer in post-menopausal women. The study points to the inhibition of CYP3A4 enzyme by grapefruit, which metabolizes estrogen (Monroe et al. 2007). Grapefruit can have a number of interactions with drugs, often increasing the effective potency of compounds. Grapefruit contains naringin, bergamottin, and dihydroxybergamottin, which inhibit the cytochrome P450 isoform CYP3A4 in the intestine. It is via inhibition of this enzyme that grapefruit increases the effects of buspirone (Buspar), carbamazepine, several statin drugs (such as simvastatin), terfenadine, felodipine, nifedipine, verapamil, estradiol, tacrolimus, dextromethorphan (significant only at recreational doses), benzodiazepines, and ciclosporin (He et al. 1998; Bailey et al. 1998; Garg et al. 1998; Bailey and Dresser 2004; Bressler 2006). The effect of grapefruit juice with regard to drug absorption was originally discovered in 1989. However, the effect became well-publicized after being responsible for a number of deaths due to overdosing on medication (Bakalar 2006). Armando, C., S. Maythe, and N. P. Beatriz. 1997. Antioxidant activity of grapefruit seed extract on vegetable oils. Journal of the Science of Food and Agriculture 77(4): 463-467. Retrieved October 9, 2007. Bailey, D. G., J. Malcolm, O. Arnold, and J. D. Spence. 1998. Grapefruit juice-drug interactions. Br J Clin Pharmacol. 46(2): 101-110. Comment in Br J Clin Pharmacol. 52(2)(2001): 216-217. Retrieved October 9, 2007. Bailey, D. G., and G. K. Dresser. 2004. Interactions between grapefruit juice and cardiovascular drugs. Am J Cardiovasc Drugs 4(5): 281-297. Bakalar, N. 2006. Experts reveal the secret powers of grapefruit juice. New York Times March 21, 2006. Retrieved October 9, 2007. Bourne, M. P. M. 1996. Barbados seven wonders: The grapefruit tree. Barbados.org. Retrieved October 9, 2007. Bressler, R. 2006. Grapefruit juice and drug interactions. Exploring mechanisms of this interaction and potential toxicity for certain drugs. Geriatrics 61(11): 12-18. Retrieved October 9, 2007. Buettner, A., and P. Schieberle. 1999. "Characterization of the most odor-active volatiles in fresh, hand-squeezed juice of grapefruit (Citrus paradisi Macfayden)." J. Agric. Food Chem. 47: 5189-5193. Cerda, J. J., F. L. Robbins, C. W. Burgin, T. G. Baumgartner, and R. W. Rice. 1988. The effects of grapefruit pectin on patients at risk for coronary heart disease without altering diet or lifestyle. Clin Cardiol. 11(9): 589-594. Retrieved October 9, 2007. Fellers, P. J., S. Nikdel, and H. S. Lee. 1990. Nutrient content and nutrition labeling of several processed Florida citrus juice products. J Am Diet Assoc. 90(8): 1079-1084. Retrieved October 9, 2007. Ganzera, M., A. Aberham, and H. Stuppner. 2006. Development and validation of an HPLC/UV/MS method for simultaneous determination of 18 preservatives in grapefruit seed extract. J Agric Food Chem. 54(11): 3768-3772. Retrieved October 9, 2007. Garg, S. K., N. Kumar, V. K. Bhargava, and S. K. Prabhakar. 1998. Effect of grapefruit juice on carbamazepine bioavailability in patients with epilepsy. Clin Pharmacol Ther. 64(3): 286-288. Retrieved October 9, 2007. George Mateljan Foundation (GMF). 2007. The world's healthiest foods: Grapefruit. The George Mateljan Foundation. Retrieved October 9, 2007. He, K., K. R. Iyer, R. N. Hayes, M. W. Sinz, T. F. Woolf, and P. F. Hollenberg. 1998. Inactivation of cytochrome P450 3A4 by bergamottin, a component of grapefruit juice. Chem Res Toxicol. 11(4): 252-259. Retrieved October 9, 2007. Lee, H. S. 2000. Objective measurement of red grapefruit juice color. J Agric Food Chem. 48(5): 1507-1511. Retrieved October 9, 2007. Monroe, K. R., S. P. Murphy, L. N. Kolonel, and M. C. Pike. 2007. Prospective study of grapefruit intake and risk of breast cancer in postmenopausal women: The multiethnic cohort study. PMID 17622247. Br J Cancer 97(3): 440-445. Retrieved October 9, 2007. Morton, J. 1987. "Grapefruit." In J. F. Morton and C. F. Dowling, Fruits of Warm Climates. Miami, FL: J.F. Morton, 152–158. ISBN 0961018410. Platt, R. 2000. Current concepts in optimum nutrition for cardiovascular disease. Prev Cardiol. 3(2): 83-87. Quinion, M. 2007. Questions and answers: Grapefruit. World Wide Words. Retrieved October 9, 2007. Willamson, J. G. 1997. The grapefruit. University of Florida: IFAS Extension. Retrieved October 9, 2007. WMUR, Channel 9. 2003. Researchers put grapefruit diet To test: Grapefruit compound lowers cholesterol, helps regulate insulin. WMUR June 11, 2003. Retrieved October 9, 2007. Worwood, V. A. 1991. The Complete Book of Essential Oils and Aromatherapy. New World Library. ISBN 0931432820. Sakamoto, S., K. Sato, T. Maitani, and T. Yamada. 1996. Analysis of components in natural food additive “grapefruit seed extract” by HPLC and LC/MS. Bull. Natl. Inst. Health Sci. 114: 38–42. Retrieved October 9, 2007. Takeoka, G., L. Dao, R. Y. Wong, R. Lundin, and N. Mahoney. 2001. Identification of benzethonium chloride in commercial grapefruit seed extracts. J Agric Food Chem. 49(7): 3316–3320. Retrieved October 9, 2007. Takeoka, G. R., L. T. Dao, R. Y. Wong, and L. A. Harden. 2005. Identification of benzalkonium chloride in commercial grapefruit seed extracts. J Agric Food Chem. 53(19): 7630–7636. von Woedtke, T., B. Schluter, P. Pflegel, U. Lindequist, and W. D. Julich. 1999. Aspects of the antimicrobial efficacy of grapefruit seed extract and its relation to preservative substances contained. Pharmazie 54: 452–456. Retrieved October 9, 2007. Graedon's Guide to Grapefruit Interactions. Vegetarians in Paradise/Grapefruit History/Grapefruit Nutrition/Grapefruit Folklore/GrapefruitRecipe. This page was last modified on 11 July 2017, at 19:27.